Super hero fans, show off your geeky side with an easy craft for Christmas that features Marvel and DC Comics. 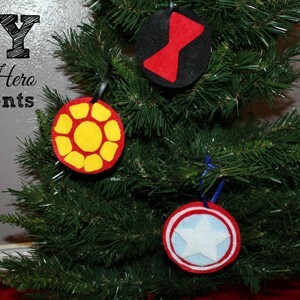 These DiY super hero ornaments will look fantastic on your Christmas tree, no matter which universe is your favorite. All you need is a few basic craft supplies and the free printable patterns. Hi! It’s Keri from One Mama’s Daily Drama. We are mostly Marvel fans at my house, although we are getting into the DC universe a little bit. I know that Danielle’s family loves DC too, so I wanted to share the super hero love here. I made three Marvel patterns: Iron Man, Captain America, and Black Widow. I also made three DC patterns: Batman, The Flash, and Wonder Woman. These ornaments are made from felt and require no sewing. They’re the perfect family craft to get everyone in the holiday spirit. I think this will be fun for a pretty wide age range. This would be fun for a Christmas party activity too. Everyone could pick their favorite hero to make. Although I think if you asked my kids which super hero is their favorite, they would say all of them. *Lay out newspaper to protect your work surface from glue and starch. 1. Start by printing and cutting out the super hero ornaments patterns. 2. Trace the outside circle on to the felt and cut it out. I used a permanent marker for everything but the black. You could use white chalk, but I just held the paper and cut slowly. 4. Stack the layers for each ornament to plan the placement. Using the craft glue, glue the layers together and let them dry. This should take about 10 minutes or so, depending on your glue. 5. When the ornaments are completely dry, pinch the top section in half and cut a small slit for the ribbon. Cut a piece of ribbon about 5 inches long. Poke it through the hole and tie a knot at the top. 6. If you want the ornaments to be stiffer, hang them up and spray the starch on both sides. Allow them to dry for half an hour or more. This step is optional and I found that some ornaments were thicker than others to begin with (like Captain America) because of the added layers. When the starch is completely dry, the ornaments are ready to hang on the tree. These are a lot of fun to make. My son was really excited to see them come together and immediately asked me if I could make more super hero patterns. If you liked this post, you might also be interested in How to Build LEGO Christmas Ornaments on One Mama’s Daily Drama. Which super hero ornament is your favorite? Okay y’all, I’m a HUGE Disney fan and go crazy over pretty much any event involving Disney – but I had NO IDEA they did themed marathon events! I mean, seriously, how fun would that be?! When I learned about the runDisney Avengers Half Marathon Weekend, it was all I could do to prevent myself from registering right that second! At first I’m like ‘oh dang, wish the kids were old enough for this’…..and then I read more and they even have Kids Races (including a Diaper Dash….really, they include EVERYONE)! 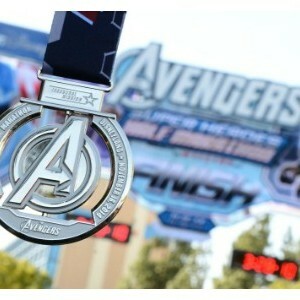 I can just picture my kiddos in their Avenger costumes racing, being cheered on by their heros. It’d be such an amazing memory for them! It’s being held November 13th-15th, 2015 at the Disneyland Resort in California. You can choose from a Marathon, Half Marathon, Captain America 10k, the Infinity Gauntlet (combine the Half Marathon with the 10k), a Superhero 5k and the kids races. Need to fuel up the night before? Check out their Pasta Party! 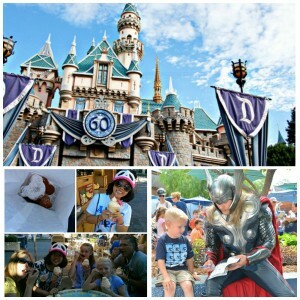 Since we already have a Disneyland trip planned just the month before, our family has to miss out this time around – but it’s definitely on our list for the future (hopefully the NEAR future!). I’ve already been brainstorming ideas on running-friendly costume ideas! The kids would be so star-struck meeting the Avengers ‘in person’. Although Hubby and I may act even more like ‘fan girls’ (or boy, in hubby’s case) than even the kids! For more event details and to register, head over HERE. After that, be sure to swing by Get Away Today to help book your hotel, theme park tickets and more to make it an unforgettable trip! Don’t forget to use Promo Code: BusyMomsHelper $10 off your vacation package. Buy yourself a couple extra Dole Whips or Churros! How would YOU dress up for this event? You’re probably not surprised to hear that my family is totally THRILLED about MARVEL’s The Avengers: Age of Ultron hitting theaters, right? Seriously, we’ve been counting down! 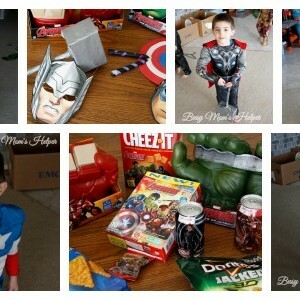 To help our family ‘prepare in style’ we stocked up an all sorts of The Avengers snacks, toys, costumes and more. Plus, we put together some super fun accessories to assist in our role playing! Read on to learn how to Make Your Own Avengers Weapons! To get started, we hit up Walmart and got all sorts of awesome The Avengers merchandise! Some of our own choices were the themed Kellogg’s Fruit Snacks, Cheez-It baked snack crackers, and fun Doritos. They even have Dr Pepper joining in the fun! If you know me at all – Dr Pepper plus The Avengers equals a very happy momma!!! Each type has a different character featured, with 7 total. Woot woot! We let the kiddos help us pick out some fun costume accessories and toys, too. Of course, they HAD to pick the gloves for Iron Man’s Hulk Buster as well as the Hulk. There was also their Quin Jet, action figures and so much more. It was hard not to get it all! Before you go, make sure to download the awesome Super Heroes Assemble app available at both iTunes and the Google Play store. Use it to scan The Avengers displays at Walmart to unlock some fun activities as your favorite characters! You can even scan any of the Dr Pepper Avengers 12 packs or signage for a digital comic book! Cut your pole to your desired length – keeping in mind it will be sticking into the 2 foam pieces. Stack your 2 pieces together, then work the handle into them so it’s down into the bottom foam chunk, about halfway in (don’t want it sticking through the top). Duct tape all around the foam and handle, making it not only secure but giving it the look of Thor’s hammer. Cut a piece of cord and use Duct Tape to secure it to the handle, looping it around into a knot. That’s it! Toss in a fun Thor mask (also found at Walmart, in the party aisle) and a costume if you wish! The order of Captain America’s Shield is (from outside to inside) Red, White, Red, Blue with a White Star in the center. Trace circles for the layers and then the star. Cut them out, then either staple them in order or use foam glue. That’s all and you’ve got a super fun – and not painful if they throw it at each other – shield! This mask also came in that party pack, along with a Hulk one! All you have to do is wrap your glow sticks with the black tape randomly. Make fun patterns, if you want! Black Widow uses these as an electrifying type of weapon – and our girl is loving having her ‘own’ weapon! They’ve been going CRAZY this week with all the fun toys and costumes, plus tasty snacks! I love that the gloves/fists are made of a soft foam material, so it doesn’t really hurt as they fight each other. Because no matter how many times I say ‘settle down’, they just can’t help it, I guess! What can’t YOU wait to grab in all your MARVEL’s The Avengers: Age of Ultron excitement? Our superhero-obsessed family has been not-so-patiently waiting for the new Avengers movie coming out this year. Although we aren’t sure if we’ll be able to let the younger kids watch it, they love the trailers, and know their heros almost TOO well from the cartoon! 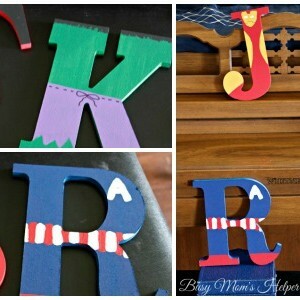 For some themed fun, we made these neat DIY Avengers Letters of their favorites! It’s so funny, because each of our family has THEIR character. I’m Wasp (in the cartoon, hasn’t been in the movies, yet), Hubby is Ant Man (can’t wait for that movie!) and the kids are Black Widow, Captain America, Iron Man and Hulk! If any of our friends/relatives call them the wrong hero, they’re sure quick to correct them. Little nutty kiddos! I love what an easy little craft this turned out to be, and totally budget friendly. You can switch it up to match YOUR kids favorite characters….do just their initial, like I did, or spell out their names! Black Widow: paint a red base coat, allowing to dry. Don’t forget the edges! Add a black angle facing inside on both sides…creating a red shaped hourglass in the center. Hulk: paint a green base coat, allowing to dry. Add some black ‘hair’ along the top edge. Use purple for his ‘pants’, making the bottom a little jagged. If you want, you can use a black sharpie pen to draw the little drawstring along the waistline of his pants. Iron Man: paint a red base, allowing to dry. Add some gold (or yellow) trim to the sides and maybe the bottom. Add an Iron Man face shape at the top with the gold. Add little white box eyes on the mask, then use a black sharpie pen to draw out the mouth shape. Captain America: paint a blue base, allowing to dry. Do a strip of red along the bottom, then somewhere in the middle do white/red stripes. Add a white ‘A’ for some fun! 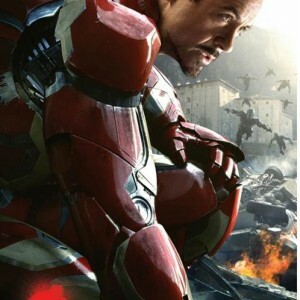 What Avenger hero would YOU choose to do? If you’ve been to my blog….like EVER…I’m sure you know what HUGE superhero fans we are. So when I heard about this great campaign that gives people a chance to not only support an amazing cause, but also enter for a chance to MEET Robert Downey Jr., I had to share! Robert Downey Jr. is offering fans the chance to live out the best night of their life culminating at the World Premiere of Marvel’s Avengers: Age of Ultron, all to support a great cause. By going to www.omaze.com/RDJ and donating just $10 to benefit Julia’s House, a children’s hospice center dedicated to helping improve the lives of children diagnosed with terminal illness, you could win a chance to live out your superhero dreams with RDJ in LA. You’ll kick things off with breakfast at the iconic Randy’s Donuts before launching into an action-packed day including a helicopter ride over the Hollywood sign, indoor skydiving, and a custom gown or tux fitting before meeting Robert Downey Jr. himself for an epic motorcade arrival at the World Premiere of Marvel’s Avengers: Age of Ultron. And yes…there will be caviar. And did we mention you’ll be one of the first people on this planet to see the newest release from Marvel’s hit franchise? Yeah, that’s happening. But the opportunity to win this once-in-a-lifetime experience won’t last forever. You and a friend will be joining Robert Downey Jr. for the best day of your lives at the premiere of Marvel’s Avengers: Age of Ultron. You will experience indoor skydiving, a helicopter ride over the Hollywood sign, a custom tux/gown fitting, a pit stop at Randy’s Donuts and caviar tasting with RDJ before riding in his private motorcade to the premiere. Flights, 4-star hotel, and transportation are all included. Best of all, every entry benefits Julia’s House. Julia’s House is a children’s hospice charity dedicated to helping life-limited children and their families. The nurses and caregivers at Julia’s house provide life-changing support for parents and their children both in the hospice and in their own homes. The majority of those children are unlikely to live beyond the age of 18, but thankfully Julia’s House is there for them year-round, offering emergency respite and overnight care during treatment and offering emotional and practical support at the end of a child’s life. Omaze is an online charity platform that raises money and awareness for nonprofits by offering everyone the chance to win once-in-a-lifetime experiences with their favorite performers, athletes and influencers. That’s everything from walking the red carpet on a date with George Clooney, to playing tennis with Serena Williams, to being in Star Wars: The Force Awakens. Founded by two best friends, Matt Pohlson and Ryan Cummins, Omaze connects its community of donors to transformative experiences, remarkable causes and compelling content. For more information, please visit www.omaze.com. Who else is absolutely obsessed with Superheros? Our family is MAJORLY in love with all that nerdy goodness, as anyone who knows us, or follows here regularly, will know! Lately we’ve really been crushing on Big Hero 6, especially the oh-so-lovable Baymax! 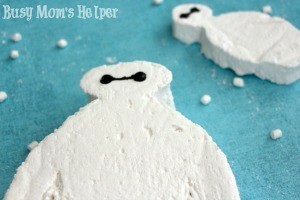 So this year for the kids’ Valentine’s, I decided to do Homemade Baymax Marshmallows! Aren’t these super fun? You can make them as big (that large one is a little bigger than my hand!) or mini versions, depending on what you’re wanting. At first I was a bit intimidated about making my own marshmallows, but it was actually super easy! Enough so that I made a FEW batches! I’m glad we’re sharing these with others, otherwise I’d be on calorie overload for sure! If you want THICK marshmallows, use a 9×13 baking dish. For thinner/average thickness use one or two cookie sheets. Take your dish or cookie sheet of choice and brush with oil. Cover with parchment paper, letting the edges stick up over the sides, then brush the parchment paper with oil also (this makes handling the marshmallows MUCH easier). Set aside. In a saucepan, heat the sugar, corn syrup, salt and 1/3 cup water over medium-high heat. Stir frequently until the sugar is dissolved. Continue boiling WITHOUT stirring about 7-9 minutes. MEANWHILE: In a mixer, pour 1/3 cup COLD water, then sprinkle the gelatin over top. Allow it to sit for about 5 minutes. When done, pour the hot sugar mixture into the mixer on top of the gelatin and whisk. Start slowly, then increase speeds to high. Beat until stiff peaks form, about 10-20 minutes. Add in the vanilla until combined. Spread the marshmallow mix quickly into your prepared dish/cookie sheet and smooth the top. Allow it to set for 3 hours. Spread some powdered sugar on your work surface. Remove the marshmallow sheet onto it, sprinkling powdered sugar on top. This fixes the sticky parts. 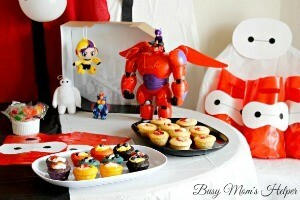 Take a knife or cookie cutter, brush it with oil, then cut out your desired shape (Baymax!!! It’s easy, he’s got the head, then a poofy belly. Then just cut out a line for his arms and his legs). Roll in powdered sugar to coat all the sticky sides. Use black frosting with a writing tip or a toothpick to create his eyes. You’re done! Store in an airtight container up to 3 days. If you want, you could dip your marshmallows in white melting chocolate for a little ‘coating’, but that’s up to you. My kids are so in love with their ‘puffy’ Baymax treats, and are super excited to give them to their friends! Have you noticed that my family is totally and completely nerd-ified? I mean, each of us have a superhero name that we regularly go by. And not just from one Superhero….we’ve got one for DC and one for Marvel. We’re just awesome like that! 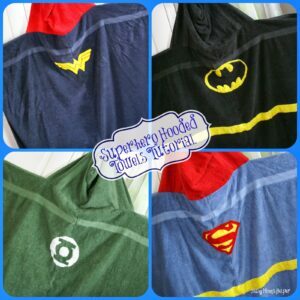 So in honor of my wacky hero-loving family, here’s 50+ Superhero Crafts! 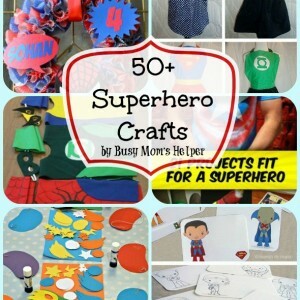 Don’t miss out on our 50+ MORE Superhero Crafts, either! If you’ve followed my blog awhile, you know that on here my kids go by Wonder Woman, Batman, Superman and Green Lantern. Hubby and I are Flash and Hawk Girl. If you want to know our Avenger names, the kids are Black Widow, Captain America, Iron Man and Hulk. Hubby and I are Ant Man and Wasp. So fun, and the kids think it’s the coolest! Here’s over 50 hero ideas for you to create with your kiddos, or just for yourself because Superheros rule! 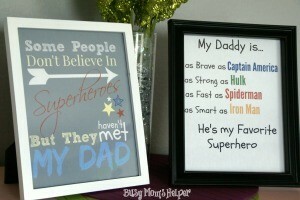 Here’s even more Superhero Crafts!